At the beginning of this year one of the weirdest characters ever to become involved in the present Afghan war died. He was called Jack Idema and he was a brilliant con-man. For a moment, during the early part of the war, Idema persuaded all the major TV networks and scores of journalists that he was some kind of special forces super-hero who was using all kinds of "black ops" to track down and arrest the terrorists. In reality, before 2001, Idema had been running a hotel for pets in North Carolina called The Ultimate Pet Resort. He had been in prison for fraud, and had tried to con journalists before about being some kind of super-spy. But September 11th gave him his chance - and he turned up in Kabul dressed like this. And everyone believed him and his stories. In the process Idema brilliantly exposed the emptiness and fakery of much of the TV and newspaper reporting of the war on terror. He told the journalists and the TV presenters all kinds of lies and fantasies. 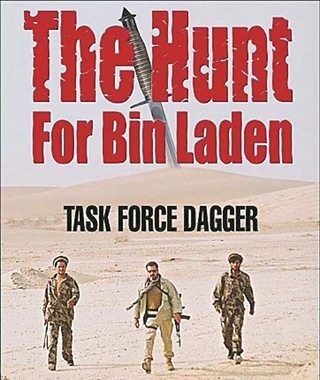 He even became the central, heroic figure in a book called The Hunt for Bin Laden. Then Idema charged journalists fortunes for what he said was an "al qaeda" video of a "a training camp" - where strangely many of the terrorists spoke in english, and allegedly you could hear Idema's voice on the soundtrack. Few of the journalists did anything to really check if any of what he was saying was true. CBS did a special programme about the tapes fronted by Dan Rather, called "Heart of Darkness". 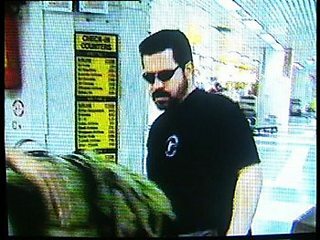 They did check on the tapes - the producers went to some of the new breed of "terror experts" that were spawning after 2001. CBS's press office said that they "showed the tapes to three former British Special Forces officers, who verified the tactics being practiced in the video were consistent with those of Al Qaeda". The BBC did a report that showed the tapes. And they travelled to the village where they had been recorded - and found an old man who said, yes there had been Arabs there. But much later a number of journalists did investigate Jack Idema properly - and the consensus now is that the tapes are probably fakes. But then Jack Idema started to believe his own stories. He set up his own militia group that he called Task Force Sabre Seven - and he and his men went and arrested Afghans they were convinced were terrorists. And then he locked them up in his own private prison. "The first night, around midnight, I heard the screams of four people. They then poured very cold water on me. I tried to keep myself from screaming, but coudn't. Then they played loud, strange music. Then they prevented me from going to the bathroom; a terrible situation. I was hooded for twelve days." In July Afghan police raided Idema's house in Kabul and found what was described as a private torture chamber. Eight hooded men, including the judge, were incarcerated there, and three of them were hanging by their feet from the ceiling, with their heads hooded. Idema and two others were put on trial - and sentenced to ten years in an Afghan jail. And all the journalists puffed a lot about how persuasive he had been. Here is Idema during the trial - still trying to persuade the journalists that he is what he said he was. And how he is being set up by dark sinister forces. But what is also interesting about Jack Idema is that in a strange way he may have been ahead of his time. Because at the moment that Idema was entering his Afghan prison, a group of very senior US military men, led by a General called David Petraeus, were sitting down in a military staff college in Kansas and beginning to write a study that would completely transform the tactics of the US army in Iraq and in Afghanistan. What General Petraeus and his team did was to go back into the past and exhume a theory of warfare that had been discredited by the US military who thought it was long buried and forgotten. It was called Counterinsurgency. And out of that would allegedly come the same kind of arms-length, privatised interrogation and torture methods that Idema was indulging in. I thought I would tell the history of how Counterinsurgency was invented, why it was discredited in America, and how it returned in 2007 to dominate and brutalise the wars in Iraq and Afghanistan. It is a fascinating and weird story that is far odder than anything Jack Idema could have dreamt up - it involves Mao Zedong, John F Kennedy, French fascists, the attempted assassination of Charles De Gaulle, and strange Potemkin-style villages in Vietnam where women get pregnant for no discernible reason. The theory of Counterinsurgency also had a terrible logic built into it that repeatedly led, from the 1950s onwards, to horror - torture, assassination and mass killing on a far wider scale than anything Jack Idema ever did in his house in Kabul. Of the many books that were influential in the writing of FM 3-24, perhaps none was as important as David Galula's 'Counterinsurgency Warfare: Theory and Practice'. David Galula is an absolutely fascinating figure. He turns up everywhere in the second half of the 20th century in the wrong place at the right time - like revolutionary China and the Greek civil war in the 1940s, Indo-China in the early 50s, and above all in the French struggle in Algeria in the late 1950s. In Algeria Galula conducted radical experiments in what was called "revolutionary warfare" - and in these experiments lie the key to understanding the strange revolutionary roots of the theory of Counterinsurgency - and why it could so easily go wrong and lead to horror. David Galula was born in 1919 in one of the most important colonies of the French Empire - Tunisia. His family were rich merchants and in the 1930s Galula went to study at the prestigious St Cyr military college in France and rose rapidly. Then, in 1946, Galula was sent to China as the assistant to the French Charge d'Affairs in Beijing. He arrived in the midst of the civil war being fought between the communists led by Mao Zedong and the Koumintang nationalists. 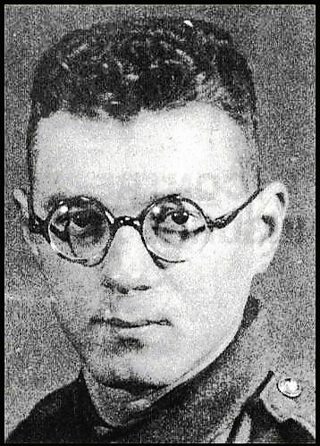 A year later Galula went on a trip by himself into the interior and was captured by the communists and held for a week. Although he was anti-communist, Galula was fascinated by the way the communists behaved towards the local people because it was different from any other troops he had seen. He began to study their tactics which were based on a theory of revolutionary guerrilla war that had been developed by Mao himself. What Galula realised was that Mao had invented a completely new idea of how to fight a war. Put simply - there was no conventional army any longer, the new army were the millions of people the insurgents moved among. And there were no conventional victories any longer, victory instead was inside the heads of the millions of individuals that the insurgents lived among. If they could persuade the people to believe in their cause and to help them - then the conventional forces would always be surrounded - and would be defeated no matter how many traditional battles they won. "The guerrilla must move amongst the people as a fish swims in the sea"
Galula became convinced that if western armies were going to fight against these new revolutionary ideas they were going to have to change radically. And the way to do it, Galula decided, was to behave exactly the same as Mao's revolutionaries - to swim among the people. Over the next eight years Galula moved around the world observing the bitter wars of liberation being fought in Greece, Malaya and in Indo China - and he saw how the French army was catastrophically defeated by the communist revolutionary army in Vietnam. And in 1956 he volunteered to go and serve in Algeria where France was fighting a war against the guerrilla army of the National Liberation Front. Galula found that other officers had been thinking along the same lines - and he was allowed to go and set up what was called "An Experimental Operational Zone". "I felt I had learned enough about insurgencies, and I wanted to test certain theories I had formed on counterinsurgency warfare." Galula took a village that was in the centre of the insurgency and sent his men to live and work there among the population. The aim was to persuade the people of the village to turn away from the insurgents and thus rob them of their power. The way to do this, Galula said, was through psychological tactics - both by making the villagers feel that they would be safer with the French, but also through indoctrination into a new and modern way of thinking about the world. If his soldiers and civilian advisers could do this, Galula believed, then the villagers would realise that the real way forward to a better life was not through the insurgents and their vicious tactics, but through the European vision of a new, modern democratic community created amid the harsh mountains of Algeria. It was a highly idealistic vision - and in 1960 the BBC made a documentary about one of these experiments. It was a "protected village" high up in the Aures Mountains. Galula does not appear - but it is the area in which he was working and is clearly modelled on Galula's theories. "How deeply can the officers influence the minds of the young Algerians by these methods? The officers in charge of the new 'protected villages' make no secret of the fact that this is what they are trying to do. What started as a predominantly military-security operation has blossomed into a fully-blown social experiment"
But at the end Mossman states bluntly "It's all too late"
But there was another side to this Counterinsurgency theory. If you could persuade the local people to come over to your side - then that would leave the insurgents who lived among the people drastically weakened. And that meant you could destroy them. But to do that you had to identify the insurgents - and that meant getting information from your new "friends" the local villagers. But sometimes they didn't want to give that kind of information, possibly because they were frightened, or they might even be an insurgent themselves, just pretending to be a villager. And that led to the French soldiers finding ways to persuade the villagers to tell them who was an insurgent. It was called torture. Here is part of a Panorama film made only two years later in the same Aures Mountain region that revealed some of the horror that had been going on in other of the "protected villages"
The Panorama film is a very weird piece of journalism. It treats the ALN like conquering heroes - and slaps an extraordinary piece of romantic music all over shots of them. But it then shows what it says is the reality of the protected camps and villages that the local population had been put in for "re-education". As the commentary says, the reality was very different from that shown by the French to TV and newspaper correspondents while the war was on. The film alleges that torture was used in the camps - and then it shows the revolutionaries unblocking an old well outside one of the villages and sending a young boy into the well to find out what is hidden down there. Here is the section of the film. There was a terrible paradox at the heart of the theory of Counterinsurgency. As formulated by people like Galula, the theory said that the colonial powers had to imitate the tactics of the revolutionary insurgents they were fighting. They had to become like a mirror that copied Mao Zedong's revolutionary theories - but in reverse, so they could pull the people away from the insurgents. But what this also meant was that in effect the Europeans became copies of the insurgents - and that could so easily lead them to use some of the same terror tactics as their guerrilla enemy. The paradox was that while this probably led to less deaths than pointless conventional battles - it also brought torture and murder and a copy of the terrorist mind-set into the heart of the European colonial armies. This was expressed very powerfully in the film The Battle Of Algiers made in 1966 about the struggle against the insurgents in the Casbah in Algiers. They key figure is the French officer Lt Col Mathieu who comes in to separate out and destroy the FLN insurgents. This is the scene in the script of the film where he elegantly and rationally argues the case for this logic of Counterinsurgency. 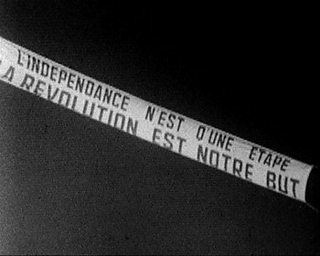 In the French military elite this ruthless extension of counterinsurgency was called "guerre revolutionaire" - or revolutionary war theory. And it captured the imagination of many of the leading officers fighting the war. But it was also going to have very strange consequences for France itself. When President de Gaulle decided to give independence to Algeria, many of the senior French army officers who had been fighting the insurgents were furious. They believed it was a complete betrayal of everything they had been fighting for, and also of the thousands of French Algerians living in Algeria. In their anger they set up their own clandestine organisation to try and stop de Gaulle. It was called the Organisation de L'Armee Secrete - the OAS - and among its leaders were some of the officers that had led the Counterinsurgency programme. But Galula himself was not among them. The OAS was a terrorist organisation that between 1961 and 1962 created an intensely violent campaign of bombings and assassinations in both Algeria and France. At one point they exploded hundreds of bombs a day, killing innocent people, to try and force the FLN to resume their terrorist attacks and thus justify the return of French control. They also tried to assassinate President de Gaulle five times. Historians who have studied the OAS have argued that this terror campaign had many of its roots in the "black ops" and techniques of subversion that had been developed by the French military in their Counterinsurgency campaign against the insurgents in the late 1950s - techniques that they had come to believe in deeply. "..the OAS's terror campaign is inexplicable without their faith in the magical qualities of the counterinsurgency theory"
What had begun as a reverse copy of Mao's revolutionary theories had now mutated into a form of revolutionary terror that was trying to bring down a major European political system. Here are some of the reports of the time - they give a good sense of the fear and uncertainty that the OAS terror was spreading through France in the early 1960s. Many believed that the terrorism was destroying the very idea of democracy. I have included an interview with Jean Baptiste Biaggi who was the leader of a fascist group called The Revolutionary Patriotic Party that had risen up out of the crisis. He talks of using revolutionary war to bring down the government - the same "guerre revolutionaire" that had been used in Algiers. But David Galula had nothing to do with this horrific corruption of Counterinsurgency. 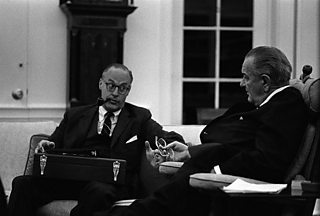 Instead, in the early 1960s, he went to America to spread his idealistic vision of the theory among the US military elite. And the reason he was invited was because an ambitious young Senator had become fascinated with the whole notion of how to fight the spread of communism around the world in a new, revolutionary way. He was John F Kennedy. Counterinsurgency ideas had first reached America in the form of a best-selling novel. It was called The Ugly American and was published in 1958. It told the story of how communism was spreading through SE Asia - helped on its way by the stupid, arrogant behaviour of the Americans there. But the hero of the novel - an American engineer called Homer Atkins - behaves differently. He goes and works in local villages to help the local people develop and modernise. Then an American military officer points out that what Atkins is doing is exactly the same as Mao's revolutionary theories set out to do - "win the minds and the hearts" of the local people. 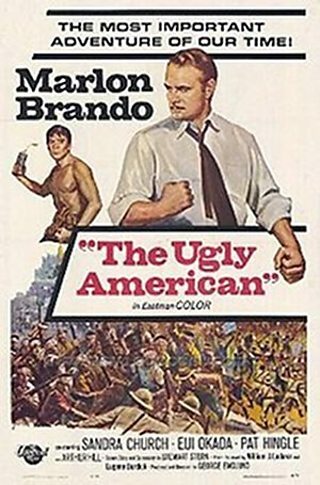 The Ugly American was a runaway bestseller and was later made into a film starring Marlon Brando. Senator John Kennedy was gripped by The Ugly American. In 1960 he and five other opinion leaders bought a large advertisement in the New York Times saying that they had sent copies of the novel to every US senator because its message was so important. And on January 18th 1961 - two days before taking office as President - Kennedy set up the new Special Group, Counterinsurgency in the Pentagon - SGCI, led by a powerful General. But there was only one problem - it couldn't find any real Counterinsurgency experts in America. So David Galula was invited over by the American military as one of the few people who knew what the new President was on about - and had even written a book about it. And in April 1962 Galula was one of the main guests at a now legendary symposium on Counterinsurgency held by the RAND Corporation military think tank. All sorts of people were there - like Lt. Col. Frank Kitson who had led the British struggle against insurgents in Malaya, and the mysterious American Colonel Edward Lansdale who was involved in attempts to overthrow Castro in Cuba, and was fascinated by communist theories of revolutionary war. Galula was the star guest and he got up to speak first. To begin with he put forward his fundamental theory. "Revolutionary warfare requires a revolutionary approach on both sides in the struggle. Whereas in ordinary war the objective is to destroy the enemy and occupy his territory, the guerrilla's aim is to control the population. This, therefore, must be the aim of the counter-guerrilla as well"
"One basic difference between insurgency and counterinsurgency is that the insurgent starts out with nothing but a cause and grows to strength, while counterinsurgent often starts with everything but a cause and gradually declines in strength to the point of weakness"
So the RAND corporation decided to find something equivalent to a cause, powerful enough to bring the villagers in SE Asia over to the American side. Up to this point RAND had been exclusively dealing with the tactics of nuclear warfare, but in the mid 60s it turned its attention to counterinsurgency - or what they started calling COIN. And very quickly there was a furious debate within the think tank. The traditionalists argued that you stuck with the Hearts and Minds approach - or what they now called HAM. But others said that this never worked because the Americans didn't have as powerful a vision to offer the peasants as the communist revolutionaries did. They didn't have a romantic picture of creating a new world. The solution, they said, was to fuse counterinsurgency with modern economic theory - above all the theory of the free market - and treat the villagers as "rational actors" in an economic system. You didn't offer them a vision, or a cause, instead you gave them "selective incentives" to co-operate with the government, plus disincentives to stop them resisting. One of the men behind this new approach was an economist at RAND called Charles Wolfe Jr. 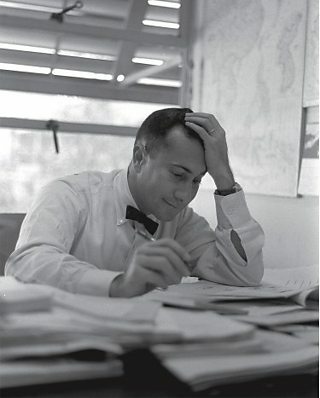 Here he is in 1965 - looking like an economist. "The Cost/Benefit-Coercion theory of Counterinsurgency"
It still believed in Galula's theory of putting the local population into protected villages and making them feel safe. But it gave up on worrying about what was in the villagers heads and treated them instead as self-interested "rational actors" who would respond in more or less predictable ways to incentives - and to disincentives. 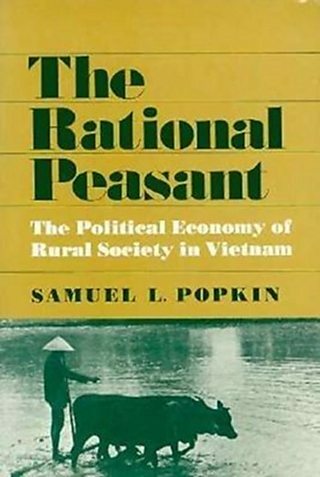 It was best summarised in a later book written by another economist called Samuel Popkin all about the cost/benefit calculations of Vietnamese peasants. It was called "The Rational Peasant"
In some ways the shift that happened in Counterinsurgency theory was a picture in microcosm of the much wider shift that was going to happen to all Western societies over the next thirty years. Politicians would give up on the idea that politics was about inspiring the people - and giving them a vision of changing the world. Instead the politicians would adopt the ideas, and the language, of economics, and turn to treating their population as individuals who could simply be incentivised and disincentivised by appealing to their self-interest. You didn't change society any longer - you managed it. But when this new hybrid theory of counterinsurgency was applied in South Vietnam in the 1960s it didn't work out the way it was intended. To begin with it led to absurdity. And then, just like in Algeria, it led to horror. Here is part of a film made in 1969 which brilliantly illustrates the absurdity. It is about a South Vietnamese village called Bin Hao - which was held up by the Americans as the model of a pacified village, an example of how their theory and its use of incentives was really working. But then the Americans discover that the village that their theory has created isn't at all what it appears to be. Their worries begin when many of the women become pregnant - yet there seems to be only old men in the village. And then they discover something much worse. I have also put at the front of the film a wonderful couple of minutes of two civilian "advisers" in Vietnam playing a board game called "Insurgency". It had been designed by one of the team to express and test out their theories. It sets the weird context for the even stranger reality that then follows. But, just as in Algeria, the counterinsurgency programme had its own logic that led to torture and murder. The aim of the protected villages and all the incentives was to separate the population from the insurgents. The next objective was to destroy the insurgents - and to do this the CIA set up what they called The Phoenix Programme. One of the men in charge was another RAND theorist called Robert Komer. He knew David Galula and had read his books, but he took a rather tougher approach which was summarised by his nick name - "Blowtorch Bob". Here is a picture of Blowtorch Bob briefing President Johnson on the sort of things he is up to. What Komer and the others who ran the Phoenix programme did was set up camps to train Vietnamese militias - drawn from the rational peasants. Their job was going to be to root out and kill the communist insurgents. Following the counterinsurgency theory, the militias were direct copies of the communist cadres. But also - following the economic model - they were to be incentivised. They were given money for killing Vietcong, twenty pounds for a village official, thirty for a district officer. "We would use the Vietcong techniques to beat them. They conducted a terror campaign, so I thought we had to conduct a counter-terror campaign to kill the VC assassins. And we did." Another of the architects of the Phoenix Programme, who is interviewed, was Nelson Brickham. He was a devotee of David Galula's ideas and he took Galula's books everywhere he went in South Vietnam. He claims in the film to have been "the conceptual father of the Phoenix Programme" - and says that it worked well. But others involved have now changed their mind. The film shows, with first hand testimony, how that counter-terror campaign ran out of control. Men who directed the campaign for the CIA say that in essence it led them to become terrorists themselves. Here is that section of the film with Blowtorch Bob and the other Americans telling what happened. There is a strong counter-argument to these criticisms. It simply says - so what? In war killing happens, and a programme of targeted assassination certainly killed far fewer civilians than the horrific indiscriminate bombing by America's conventional forces. But the documentary goes on to show how the Phoenix programme created something much worse - which it was powerless both to understand or to stop. The Rational Peasant approach looked at Vietnam as a society of millions of self-seeking rational individuals. In reality, Vietnamese society was far more complicated. Extended families had tangled and intricate histories of relationships - some were friendly but many were driven by rivalries and hatreds. As the film makes clear this had created a powerful tradition of violent retribution in Vietnamese society - and it goes on to show how some of the militias that the Americans had created used the free rein their masters gave them, to kill and torture not communists, but other, innocent civilians against whom they had long-standing grudges or hatreds. One CIA officer describes how he found that the local police chief was using their programme's safe house to torture and carve up people who didn't have the right family protection. An innocent Vietnamese woman who was tortured describes how the Americans just stood and watched. It shows the terrible limitations of the economic model of society. The Americans were helpless because their militias would assure them that the people they were torturing were communists. And when you look at everyone as simply a "rational actor" you have no way of knowing whether they were telling you the truth or not. After such experiences in Vietnam the whole idea of Counterinsurgency in the American military was discredited. It was buried away and forgotten. It was replaced in the 1980s by what was called the Powell-Weinberger doctrine. This said that the US should only get involved with a conflict where there are clear objectives and it can use overwhelming force. But after the invasion of Iraq in 2003 the Americans became bogged down in a new guerrilla war. And so - in 2006 - General David Petraus' team dug up Counterinsurgency again. They took David Galula's ideas and made them the central architecture for a new idea of how to rescue Iraq from the horror that had engulfed it since the invasion of 2003. At the beginning of 2007 Petraeus was given 20,000 extra troops - and he used them to create a counterinsurgency campaign in Iraq modelled on Galula's theories from the 1950s. And Galula's central idea - copied from Mao Zedong's revolutionary theory of warfare - that you swim among the people like a fish in water, became the driving idea behind "The Surge". Here are some unedited rushes recorded in July 2007 - they follow General Petraeus visiting Baqubah -which had been one of the most vicious battlegrounds of the insurgency. General Petraeus shows the BBC reporter John Simpson how the surge is working. As Petraeus talks you can hear the ghost of Galula and his ideas. It is just like the French officer showing a BBC reporter around The Experimental Zone high up in the Aures Mountains fifty years before. But - just like in Algeria - there were also suspicions about what might be really happening. That the Iraqi army and police were also involved in sectarian killing under the cover of the surge. John Simpson is a very good reporter - and he knows this and asks the sharp question of the local commander that Petraeus is visiting. The officer's response is, to put it mildly, a bit naive. And there were other suspicions about the Iraq Surge of 2007. That there was something far more violent and sinister behind it than the simple Hearts and Minds approach. "The truth is that other factors were as or even more important than the Surge. The operations, which were part of Special Compartmented Information (SCI) incorporated some of the most highly classified techniques and information in the US government"
But a number of authoritative sources say these covert activities had a far-reaching effect on the violence and were very possibly the biggest factor in reducing it. Several said that 85-90% of the successful operations and 'actionable intelligence' 'had come from these new sources, methods and operations." The words 'actionable intelligence' are a bit opaque - but they do imply that there was, just like in Algeria and in Vietnam, a large-scale programme of targeted assassination. There have also been claims made that, again just like in Vietnam, the Americans gave over much of the operation of the programme to the local militias that they had trained. In this case these were the predominantly Shia Iraqi army and police. And these Iraqis, it is alleged, then hi-jacked the programme and used it to torture and assassinate their Sunni enemies on a wide scale. The COINdistas strive to prove the surge strategy is an enlightened form of combat - "graduate level of war" as the manual FM 3-24 calls Counterinsurgency. But the reality on the ground is dark and not very reminiscent of graduate school. Petraeus and his allies decide to team up with a Shiite Islamist government, picking the majority's side in a civil war. The Americans themselves round up tens of thousands of youg Iraqi males. The Iraqi army and police, fully funded and trained by the US military, conduct a campaign of torture and killing, assassinating suspected enemies and abusing Sunnis with electric shocks and power drills, with entire units being used as death squads. The Sunnis respond in kind. The American response to this campaign, as the New York Times would later note, was an 'institutional shrug'." Very much the response of a Rational Peasant. In June 2007 Jack Idema was suddenly, and rather mysteriously, freed early by President Karzai. He went off to live in a house in Mexico and ran a charter boat for tourists. He had a new girlfriend called Penny who had corresponded with him while he was in prison in Afghanistan. Then last year he fell ill, and died in January this year of AIDS-related complications. After his death Penny described how in his in time in Mexico Idema got lost in the different personas he was playing. For the tourists on the charter boat he played the role of what he called "Captain Black Jack". Idema modelled this on the character of Jack Sparrow played by Johnny Depp in Pirates of the Caribbean. But at home Idema dressed up in Arab Robes - like Lawrence of Arabia - drank heavily, took cocaine and continuously played Arab music, the soundtrack to Apocalypse Now, and What a Wonderful World by Louis Armstrong. And David Petraeus is tipped by some to be the next US president but one.